This was the car that STARTED it all. We were almost sad to see it go. This is the car that STARTED it all. It was owned and cared for by a very special man: our grandfather. When he passed, my cousin Jaime, my brother Juan and myself, Nelson, decided to restore our grandfather’s beloved vehicle to its full glory. Our grandfather only owned two vehicles in his life. One was a 1968 Sky Blue FJ40 Hardtop and the other was this one. Sadly, we cannot find the ’68 model, so we took extra care to ensure that the 1982 received the best possible restoration. My brother Juan liked the end result so much that he bought our shares of the car and took it with him to Miami. Meanwhile, Jaime and I had so much fun with the restoration process that we set out to build more like it, effectively launching The FJ Company. Today, Juan uses this FJ to drive his kids to school during the year and then ships it to Colorado to take them to camp in the summers. 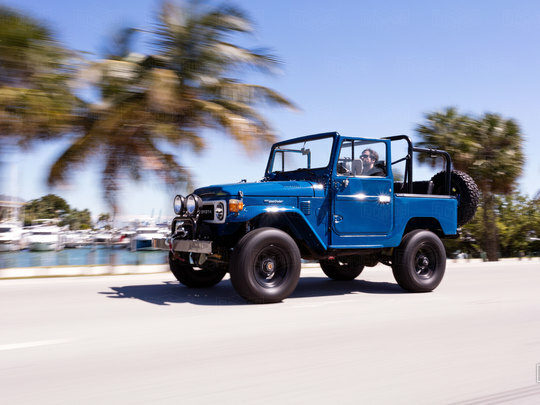 To give it a more contemporary look, Juan added unique features, such as a convertible soft-top, a modern winch, FJ70 seats and MT wheels. It’s truly one of the coolest family cruisers we’ve seen! In fact, Juan was using the car so much, that Jaime and I started to worry about safeguarding our grandfather’s legacy. So we convinced him to return this car back to its original condition and build a new one better suited to traverse the great Rocky Mountains.